LOUISVILLE, Ky. (AP) — Muhammad Ali is home after being hospitalized with a severe urinary tract infection. The three-time world heavyweight champion was released from an undisclosed hospital Tuesday night, family spokesman Bob Gunnell said Wednesday. Ali is back home and looking forward to celebrating his 73rd birthday on Jan. 17 with his family and friends, Gunnell said. Ali has had Parkinson’s disease for years. 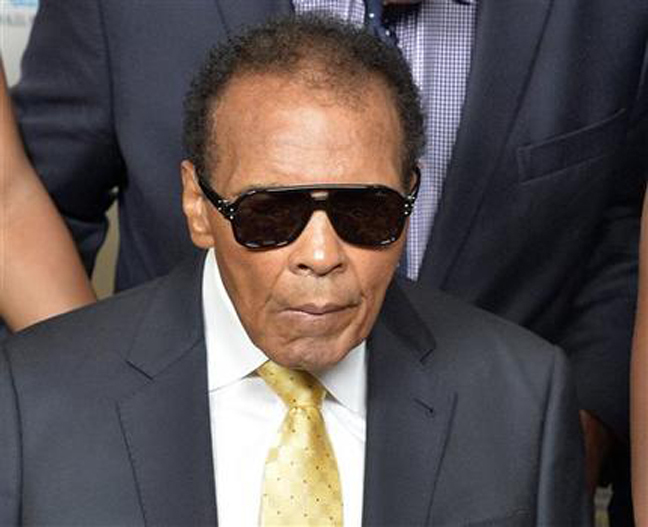 Ali was hospitalized Dec. 20 with what was initially believed to be a mild case of pneumonia. Doctors later determined Ali had a severe urinary tract infection and not pneumonia, Gunnell said. The Ali family appreciates the outpouring of support and well wishes, and also thanked his team of doctors and nurses, he said. Ali and his wife, Lonnie, have homes in Paradise Valley, Arizona; Berrien Springs, Michigan; and in Louisville. Gunnell would not say which home Ali had returned to. Ali’s public appearances have diminished in recent years as he wages his fight against Parkinson's disease, but he appeared in public in September at a ceremony in his hometown of Louisville for the Muhammad Ali Humanitarian Awards. Ali did not speak to the crowd but posed for photos with award winners, including former NFL star Jim Brown. Ali retired from boxing in 1981 and devoted himself to social causes. He has traveled the world on humanitarian missions. Ali received the Presidential Medal of Freedom from President George W. Bush in 2005. The Muhammad Ali Center, in Louisville, is dedicated to Ali’s humanitarian causes and showcases his boxing career, reliving his epic fights with Sonny Liston, Joe Frazier and George Foreman.